California, Texas and Florida represent about 30 percent of the total national book publishing market, according to the Center for Education Reform. These states are the largest source of profits for publishers. California spends approximately $400 million per year on textbooks, according to the California Open Source Textbook Project, while Texas spends approximately $500 million per year, according to the Texas Education Agency. Florida’s spending is closer to $260 million per year, according to the Office of Program Policy Analysis and Government Accountability. And while state budgets are becoming tighter, the price of textbooks increases annually. 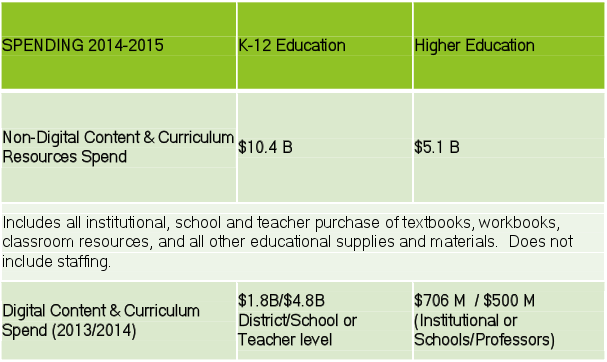 According to the Association of American Publishers (AAP), the K-12 textbook market reached $6.4 billion in 2007, and the average spending per pupil for books in U.S. public schools amounted to $64.51 annually or 36 cents per instructional day. ﻿Florida has already passed legislation requiring districts to spend half of their instructional-materials budgets on digital content by 2015-16. Alabama is considering a bill that would use $100 million in bonds to give digital textbooks and tablets to students. California, Indiana, Utah, and Washington state have all passed legislation promoting digital education content. Multimedia learning is defined in the literature as learning through both visual and audio channels. It assumes that learners can only process a limited amount of information at a time through each channel (Mayer, 2009 Mayer, R. E. (2009). Multimedia learning. New York, NY: Cambridge Press. [Crossref], [Google Scholar]). The terms interactivity or interaction refer to similar concepts and are often used interchangeably. Su et al. (2005) claimed that interaction focuses on dynamic activities, whereas interactivity emphasizes the features or interaction level of the media. Proponents of digital textbooks say they save school districts money, even when factoring in the costs of tablets. In figuresRequires Adobe Acrobat Reader cited by the Digital Textbook Collaborative from Project RED, a research project that examines the use of technology in education, a 500-student school can save between $35 and $250 per student per year by switching to digital textbooks. Web-based learning can be an effective way to improve the quality of education, overcome the limitations of time and space, and integrate educational resources from the Internet. The aim of interactivity design in WBI is to design more acceptable technology. Electronic books usually contain multimedia features such as animated pictures, background sounds and music that plays along with the text that enables students to learn more deeply compared to plain or static non-multimedia enriched text (Mayer 03). In the meta-analysis by Takacs, Swart, and Bus (2015) multimedia additions that directly connect to the verbal information are shown to contribute to learners, e.g., in story nd language comprehension as listening to multimedia enhanced stories improves comprehension. Multimedia additions are especially fascinating to young children whose attention improves as they listen to the story thereby improving their motivation to reread the stories (Verhallen & Bus 2009). Santally and Raverdy (2006) indicated that the biggest strength of e-Learning lies in breaking down the time and space restriction and providing learners with more opportunities to learn with greater spontaneity. students by two standard deviations. Scrolling and typing page numbers are two common methods for navigating digital documents. However, these methods have weak efficacy for forming a spatial representation of the document during reading (Laakso, Laakso, & Saura, 2000). Scrolling can indicate only a rough approximate position and gives readers different aspect ratios. Typing page numbers makes page-to-page navigation immaterial by weakening the association between pages and text (Wästlund, Norlander, & Archer, 2008). The two problems impede readers in constructing cognitive maps and thus lower recall and navigational performance. Although these technologies have improved screen reading considerably, recent studies have shown that the support for active reading, such as reading academic textbooks, remains unsuitable and insufficient. One problem is that readers have difficulty constructing an effective cognitive map, which represents the spatial arrangement between objects in an environment (Morineau, Blanche, Tobin, & Gueguen, 2005; Thayer et al., 2011). The difficulty may be due to (1) the lack of contextual information cues, and (2) ineffective navigational mechanisms in e-books (Chun & Jian, 1998; Morineau et al., 2005; Rose, 2011; Thayer et al., 2011). Given today’s high-tech society and the textbook publishers push to E- textbooks, it was surprising to see that traditional students, typically considered digital natives, still preferred traditional textbook methods. In fact, many of the students held strong opinions against E-textbooks which may be why paperbacks were the preferred textbook choice. This preference may be more wide-spread than identifed in earlier research which detailed the surge in sales of e-books and e- readers (Bradley, 2012). The interactive textbook group Teacher indicated that technical issues could have prevented students from wanting to access the e-textbook and therefore it was not fully utilized. In the study by Dennis et al (2015) the group using the e-textbook with annotations performed better on the quiz at the end of the session, but perceived that the textbook did not meet their learning needs coparent to the print-based textbook group. Other research has focused on the actual use of print versus e-texts, showing that reading of academic texts on screen is more difficult than reading on paper, leading to lower recall and performance (Li, Chen and Yang, 2013). Johnston et al. (2015) found that even though students were able to easily use e-texts, they experienced a drop in enthusiasm for the e-textbooks over the course of their pilot study. Additionally, almost half of their subjects reported using an e-text less than they had used previous print textbooks. We see what we call the seductive interaction effect as having three potential outcomes: distracting, supporting, or extending readers’ comprehension of the text. Table 1 summarizes each of the three outcomes and provides examples of each. Testing has to change if we’re going to do this. Learning has to change if we’re going to do this. Teaching has to change if we’re going to do this. Moreover, Rovai, Wighting, Baker & Grooms (2009) argues that a student’s grade may be contributed not only by what the student learned but also by other factors such as participation in class among others. Grades could also vary depending on Teachers hence grades may not be a reliable measure of learning (Rovai et al. 2009). Hao and Jackson (2014) looked at 115 subjects using e-textbooks in two different classes and found that gender, grade point average, and time spent weekly reading e-texts can significantly predict different dimensions of satisfaction with texts. s (2009) argues that a student’s grade may be contributed not only by what the student learned but also by other factors such as participation in class among others. Grades could also vary depending on Teachers hence grades may not be a reliable measure of learning (Rovai et al. 2009). the static PHD e-textbook group performed higher on the unit final test significantly compared with the interactive textbook group. From the results of the interview conducted with the Teachers, the static PDF e-tectbooks group were more inclined to take notes on paper, rather than to flip between screens and take notes online, as indicated by their teacher. As they adopted the more traditional method of notetaking as you would in a paper-based textbook, this could have aided their final test results. One prerequisite of the visual cue map is that readers must actively create contextual cues when reading. However, the construction of contextual cues depends on the reading habits of individual readers. If a reader does not create any contextual cues, he/she does not acquire the advantages of the visual cue map. Therefore, the design of the system incorporated two reading strategies: surveying and questioning, to force and motivate readers to create contextual cues. We note a potential parallel in writing and using computers. Learning to use a computer to write required a learning curve. Perhaps a similar pro- cess lies ahead with electronic texts. Electronic texts may increase in popularity once students become more familiar and comfortable with reading books on com- puters. we believe that the more functions that are provided in a WBI system to help learners complete their learning activities, the higher the learners’ satisfaction will be. It is also important however, to determine how to employ a learning strategy that integrates interactive function design and learning activities. Dennis et al (2015) suggests that students need to adjust their studying process in order to adapt and become more familiar with the new technology that more instruction is required for the students. Santally and Raverdy (2006) suggested that learners have to be responsible for their own learning effectiveness in an e-Learning environment. Sujo de Montes and Gonzales (2000) also argued that online students tended to be risk takers in terms of technology use and technology integration and suggested that learners in the e-Learning environment needed to be their own teachers. Therefore, designing an effective e-Learning environment that encourages students to take the initiative in their own learning is crucial. ach function designed in the high group corresponded to different learning needs. However, by presenting all of the functions together, it could increase the learning load at the beginning. According to the questionnaire and interview results, the perceptions of interactivity were affected by two factors: the time spent using the interactive functions and the design of the learning activities. A longer learning time is required for learners to acquaint themselves with a system that has more complex interactive functions. Therefore, we suggest that instructors adopt a training wheel strategy (Bannert, 2000) that provides limited functions in the initial period and gradually increases the number of available functions as learners become familiar with the operations and completely adopt them for their learning activities. More suitable functions can be employed according to the requirements of various learning activities. For short-term and first-time use, learners prefer interacting with a medium- or even low-interactivity system (Kettanurak et al., 2001). This implies that more mental effort is required to become familiar with the various operations of a high-interactivity system in a short time. Therefore, to accommodate learners’ needs, the instructor should modify or select interactive functions that are more suitable for different learning goals. Although, over time, users can handle poorly designed system operations as a result of sufficient trial and error, they are able to understand only the mechanism of these systems, but not the principle behind them. If any exceptional conditions occur, users can handle them intuitively. The findings of this study are consistent with those of Dillon (1987), who investigated the effects of deep and shallow user knowledge on their interactions with computers. Therefore, we believe that the evaluation of interactions involves not only behavioral measures but also users’ perceptions. The interview data indicated that the more time learners spent using the system, the greater their skills became. The learners needed time to become familiar with the operations initially, but eventually became skilled at using the system’s functions after continual repetition of the operations. The learning curve is shown in Fig. 5. The students in the interactive e-textbook group enjoyed the interactivity provided in the textbook but it did not enhance the test scores. The use of chrome books in class could have led to students getting distracted via email or internet programs. The interactivity did enhance student perception of learning…however it was identified that the students did not know how to learn fro the e-textbook effectively. Based on the foregoing recommendations, this research concludes that a successful Web-based formative assessment system should include at least four important strategies: ‘repeat the test’, ‘correct answers are not given (with timely feedback)’, ‘query scores’ and ‘ask questions’. Gardner et al. found that the design of ‘Self-Assessment’ was helpful to the effectiveness of e-Learning and that students liked to use this design to facilitate their own learning in the e-Learning environment. Peat and Franklin adopted ‘Adobe Macromedia Authorware’ to develop SAM (Self-Assessment Module; Peat, 2000) and integrated it into the e-Learning environment of the university ‘Biology’ course. SAM allowed students to perform Web-based formative assessment online. The study found that such assessment could help improve students learning effectiveness. Bransford et al. (2000, p. 257) argued that teachers should make use of formative assessment to provide students with numerous opportunities to perform self-assessment, obtain feedback and revise mistakes. Based on this idea, this research takes ‘repeat the test’ and ‘timely feedback’ as the key strategies in Web-based formative assessment. Buchanan (2000), Henly (2003), Khan et al. (2001), Peat (2000), Peat and Franklin (2002) and Velan et al. (2002) also believed that ‘repeat the test’ and ‘timely feedback’ should be included in the strategies of Web-based formative assessment. This research therefore concludes that combining the three strategies of ‘repeat the test’, ‘correct answers are not given’, and ‘timely feedback’ will enable students to make good use of Web-based formative assessment to facilitate their learning. In addition, other commonly suggested design strategies in research papers, such as ‘query scores’ and ‘ask questions’, should also be included in Web-based formative assessment system. The idea of assessment-centred learning environment (Bransford, Brown, & Cocking, 2000) can be taken as the basis of designing an effective e-Learning environment. Bransford et al. pointed out that in an assessment-centred learning environment, a successful teacher would not only make use of formative assessment to give learners constant feedback but also cultivate their ability of self-assessment, with which learners could evaluate their own learning at any time, thus in turn promoting overall learning effectiveness. We encourage teachers to provide guided instruction with interactive picture e-books through activating students’ background knowledge before reading, prompting students to answer comprehension questions during reading, and helping students to extend their thinking about the text after reading. Hence, the aim of interactivity design in WBI is not only to deliver learning material efficiently, but also to facilitate communication between learners and instructors. Mayer et al. (2009 Mayer, R. E. (2009). Multimedia learning. New York, NY: Cambridge Press. [Crossref], [Google Scholar]) conducted many experiments in different subjects and suggested 12 design principles for multimedia learning as guidelines for effectively presenting data or information through the two channels – audio and visual. These principles aim to avoid redundancy and help learners reduce cognitive overload to promote learning and thorough understanding, and enhance long-term memory (Mayer, 2009 Mayer, R. E. (2009). Multimedia learning. New York, NY: Cambridge Press. [Crossref], [Google Scholar]; Moreno & Valdez, 2005 Moreno, R., & Valdez, A. (2005). Cognitive load and learning effects of having students organize pictures and words in multimedia environments: The role of student interactivity and feedback. Educational Technology Research and Development, 53, 35–45. doi: 10.1007/BF02504796[Crossref], [Web of Science ®], [Google Scholar]). Seven of these principles for written text are discussed in this paper are: (a) Coherence – presentation of essential information only, rather than essential material and additional material; (b) Signaling – highlighting of important information or key concepts; (c) Spatial contiguity – placement of essential descriptions next to the corresponding picture; (d) Temporal contiguity – presentation of corresponding words and pictures at the same time; (e) Segmenting – allowing learners to control the pace of the learning material instead of being engaged in a continuous learning process; (f) Pre-training – informing learners about the names, functions and characteristics of the learning material; and (g) Multimedia – learning with both images and word than better than either images or words. These principles are intended to relieve learners of the burden of dealing with unnecessary cognitive processes. Model for complex load calls for learning tasks to be sequenced in ways that reduce cognitive load. Learners are gradually introduced to a series of task classes, each of which represents, on a simple to complex continuum, a version of the whole task. ■ Do the interactions provide support that would help a reader make a text-based inference or understand difficult vocabulary? Are there more supporting and extending interactions than distracting interactions? ■ Are the interactions time- consuming, or are they relatively brief in nature? ■ How often are interactions used in the book? Are the interactions strategically placed to enhance motivation without distracting the reader from the text? Do the interactions occur within the text, or are readers directed to another screen while reading? may be overwhelming to readers, particularly students who are still learning to read. Gao and Lehman (2003) designed three different levels of interactivity in terms of functionality, response time, and activity in order to determine the learning effects, motivation, and time on task. They found that users of a highly interactive website performed better because real-time feedback increased learning motivation. Increased interactivity with a computer-based lesson yielded greater depth of learning and helped learners understand the material (Evans & Gibbons, 2007). Moreover, more interactive designs not only enhanced the learning effect but also improved learners’ perceptions. The findings of two studies (Lustria, 2007; Thorson & Rodgers, 2006) indicated that the higher the interactivity level of a website, the more positive users’ attitudes tend to be. The factors that affect learners’ levels of satisfaction with regard to a WBI are: (1) learning environment; (2) instructor; (3) course content; (4) learning result; and (5) interpersonal interaction. In terms of the learning environment and course content, past studies have found that the quality of the content and other related features of the operational mode and flexibility have a greater impact on learners’ satisfaction because they are considered to be of more use and provide more assistance (Arbaugh, 2000; Johnson et al., 2008; Liaw, 2008; Sun, Tsai, Finger, Chen, & Yeh, 2008; Teo et al., 2003; Zhang, 2005). The more interaction design elements that appeared in the interface and content structure, the more likely the learners were to control their learning progress. Flexibly designed content structure enhanced knowledge acquisition and learner control, which ultimately reinforced learners’ perceptions. This suggests that it is essential to ensure readability in the content structures and adequate support for learning. We could conclude that in terms of learner–content and learner–interface interaction, the more interactive functions that are included, the better the results are. For the other interaction types, providing basic communication functions is sufficient for social interaction. The lower satisfaction level of the low-interactivity group was the result of the design of the system which lacked effectiveness and efficiency, meaning that the users could not achieve a specified set of learning activities when they interacted with the system. Therefore, the learners preferred an easy-to-use, simplified interface that provided well-defined operations and improved their perceptions. This corresponds with the work of Dillon & Zhu (1997), which recommends that HCI design should provide greater efficiency and effectiveness in order to satisfy learners’ needs when they interact with technology. A simple, clear Web layout design in the WBI system can help learners navigate easily. This study provides three perspectives for further understanding of users’ possible perceptions of WBI. The findings have implications for the development and implementation of WBI systems. First, an important finding is the suggestion that iterative practice reduces problems with system operations. However, the negative effect of low interactivity does not fade with time and may be reflected in users’ attitudes and satisfaction. The recent development of e-ink and tablet technologies has popularized reading with digital devices. These technologies provide novel functionalities to reduce the drawbacks of reading on screen. For example, e-ink increases readability and reduces eye effort. The tablet PC with touch and vertical screen provides intuitive and habitual operations. Therefore, users are satisfied with these reading devices for reading text, which does not require active reading strategies, such as reading novels (Thayer et al., 2011). Through contextual cues, readers incidentally associate the physical location of information within a text and its spatial relationship to the book as a whole. Readers can acquire survey knowledge through the table of contents, which describes the location of a chapter, section, picture, or table by page number. People can sense the relative relationship between objects, but have difficulty sensing real distance and area from the page number. Therefore, some paper textbooks present the pages of a chapter with the same color in the fore edge to help readers sense the distance and area. People also use bookmarks to indicate the physical positions of some important text in the textbook. The enhancement of these contextual cues not only guides where ideas are located in a book, but also supports more effective retention and recall of textual information (Chun & Jian, 1998; Morineau et al., 2005). n e-book system with an incorporated visual cue map was developed. The design of this e-book system must achieve three major goals. First, it must provide basic annotation functions such as highlighting, commenting, and bookmarking, which are the most necessary functionalities for e-book readers (Thayer et al., 2011). These functions also allow readers to create contextual cues to acquire landmark knowledge. Second, the system must support students in the creation of the visual cue map. Third, the system should motivate readers to create contextual cues.